Side Room in Tiny Pink Stripes? I’ve been thinking about this tiny room a lot this week. It hasn’t gotten much attention. 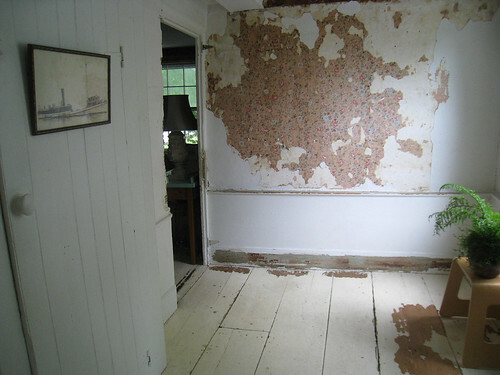 We started removing layers of wallpaper sometime last fall for fun. I love the wallpaper but it does need to go. It has paint and plaster stuck to it. The paint probably has lead and not the best idea to have in a house that could have kids. So sorry guys the wallpaper does have to go. I hope I can save a big piece and have it framed. I’ve thought about painting the walls pink (see inspiration here). I have a chair rail so the bottom with be an off-white just like the rest of the molding in the house. I had an idea this week to paint the walls a ticking pink stripe (like this). Maybe pink and khaki? The problem? Finding painter’s tape narrower enough to use. I found 3/4″ painter’s tape but I don’t think that will be narrower enough to get the look I want. Am I being crazy? Other things that I hope will happen in the room. The bookcase will get replaced with a smaller table with some baskets below and a mirror and some pictures above. 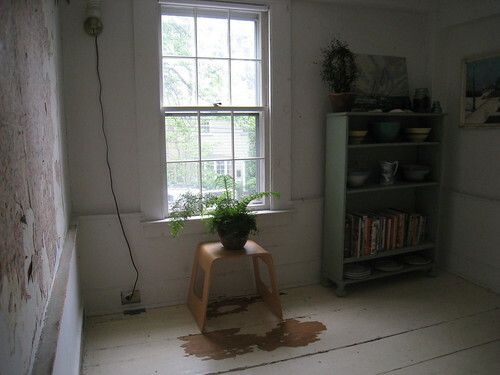 I want a pretty stool or table to fit under the window for my plants. Floral curtains and more art. The floor will get stripped and then maybe a muted antique rug. 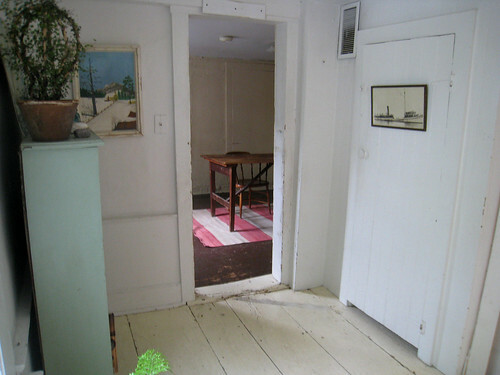 Below photos from every angle of this very small room. What The Heck Are We Working On? Wow, thanks everyone for all your help! I forgot to mention that the glaze for both the strie and combing technique should be tinted pink as well. I'm a decorative painter and have done many a striped room. Taping off stripes is mind-numbingly tedious. I generally make wider stripes (2-4" wide). First you have to mark off the stripes with a level (if you want perfectly plumb stripes), then you tape off the stripes. I've spent days just on those two prep steps before even getting to the painting. For such a tiny stripe that you want, I'd base paint the walls a light pink, glaze over them and while glaze is wet, use a combing tool to drag through to make the stripes. They will be softer than a taped stripe but you'll still have your sanity! Combing is also a very traditional surface treatment and totally suitable for your house. There is also strie which is a similar way of doing stripes but using a brush to drag through the glaze instead of a combing tool. Strie ends up looking like fabric to me because of the softness of the lines. what a fantastic room! i don't think you can go wrong no matter what you decide… love love love the floor! I guess I am the odd man out but I am still IN LOVE with that pink room, it has the same feel as your room. I love the white washed floors and I especially like the gray accent color….just my opinion but I think you may get tired of the stripe..the pink would make that room POP!…and think how great your paintings would look against the pink…how about an upholstered bench in ticking? Don't be afraid to paper back some inexpensive ticking stripe to hang above the chair rail. It goes up just like wallpaper and will be much less hassle than taping out thousands of little bitty stripes. Not to mention the fabric texture on the walls will add a lot to the space. Of course if you do paint the stripes it will be phenomenal either way- can't wait to see! also, look into drafting tape, I know that comes in .25 in. and could be picked up at a local art supply store. The 1/4 inch one is in the right hand column about half way down the page. It is by scotch. 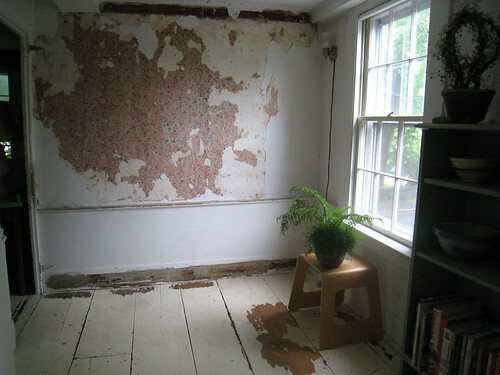 Looking at the room pictures, I thought that maybe you could put up some nice shelves on the wall with the old wallpaper. Then on the shelves, you can put some nice display jars with some flowers petals of different colors in them. Then maybe but a little desk in the opposite corner. For some color in the room I thought about some "Japanese masking tape". look it up. Thanks AmyKay for the tape tip. I have to ask a designer friend if she can get me some. Try the white tape fashion designers use to drape clothes. It is about 1/3 of an inch and should come right off the wall. Love, love, love the paint idea!!! I love that you have pretty plants around even though everything is a WIP. It's going to be amazing!! And, I love the idea of framing that wallpaper. I love the wide plank floors! What a cute little room.